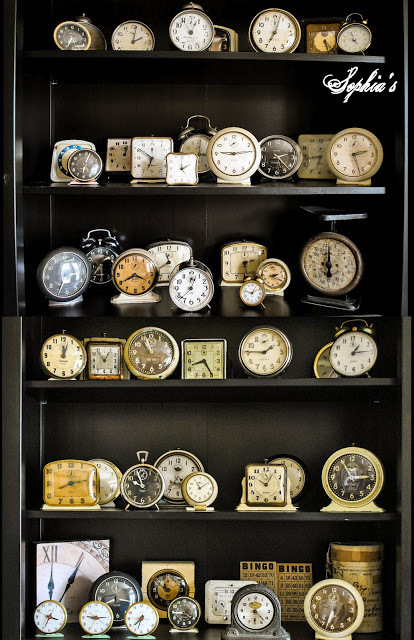 The man that owned all these clocks had them stored in several cabinets throughout the house, including the one above. He was always looking for antique/vintage alarm clocks wherever he went and used to wind them up nightly (the ones that worked) and was very sentimental about his clocks. I could sense that this widow was missing her husband very much and I vowed to myself that I would keep the collection going. I often think about him when I'm dusting off all those clocks! I'm a sentimental sap in many ways. Anyway, back to the cabinet... As I was hauling away the smaller cabinet that I'd originally come for, I couldn't stop staring at this one and finally got the guts to ask if she was selling it and how much would she be willing to part with it for. $200...that doesn't seem much now for a large cabinet, but at the time I'd never spent that much on a piece of furniture (except mattresses) in my life! Needless to say, it came home with me and I'm so glad that it did! Since moving into my home in Raleigh, it still remains one of the most expensive pieces of furniture that I've purchased besides my IKEA sectional and my trestle dining table. Yes...that's why my tag line is "Live Beautifully on a Budget"...I'm a bit on the frugal side. I love how the white dishes contrast with the wood and it's fun to decorate the top for Christmas! Normally it's a revolving door of furniture in my house, but I think I'll be hanging on to this one for a long, long time. Just gorgeous and I can see why it is your favorite. Perfect vignette on top. Hi Kristen, I love the story of your beautiful cabinet. The clocks are great too! thats a beautiful piece and you certainly made it look Holiday Special. What a beautiful piece, and a beautiful story, I can see why you love it. And the clocks are wonderful. That was your lucky day! Its beautiful! I love a great story..glad it came home with you. Love all the clocks too..I have a few myself. Merry Christmas! I have noticed that cabinet in many of your posts and wondered if it was waiting a makeover. I was hoping it wasn't. It really is a special piece and I would love to have something as lovely! Glad to know where the clock collection comes from. I like them so much since they fit into that industrial look that I like (but in small doses!). Very cool! This is so beautiful, and what a nice story to go along with it. I, too, love the contrast of your white china against the pretty wood. And the way you have decorated it for Christmas is gorgeous. The green looks so wonderful sitting atop this cabinet. Love all your clocks--what a great thing to collect! What a lovely wooden cabint and you have some lovely items in it. I also love the old clocks I'm always on the look out for vintage clocks. I enjoyed reading the story about your wonderful cabinet. It is so pretty and well organized! You have such a fantastic collection of vintage clocks. I hope you will stop by for a visit. Your cabinet looks so lovely! Hi Kristen, this cabinet is the best! I have one from my Grandma, kind of beat up but I love it so and will keep it always. You can see it in my Christmas photos and may enjoy some of my decor and other things at Maddalee, I'm a new follower. You are right, the white dishes look fantastic against the wood and I like the use of the simple greenery. The clocks are a real prize! I love the look of all the clocks together - its just a wonderful nostalgic look to me! You are right, your white dishes look great against the wood in your beautiful cabinet! I like the use of simple greenery with this. The clocks where a real prize! They look great all together, a real nostalgic look for me. The cabinet makeover is divine! And, I love it's personal story. i love the scrubbed lovely quality of it. it glows. I love this cabinet and the story that goes with it. It is so nice to see natural wood for a change. I admire painted furniture but sometimes I feel that it is getting overdone. I like that you have kept the wood and the same hardware. Your displays are great as well! That is a nice cabinet! And your clock collection is over the top. Such a beautiful piece and a beautiful display - love how you decorated the top! Visiting from AtoZ... Rhonda @ home.made. Love the cabinet too. The clocks are amazing, but my favorite are your Christmas - ball - tree - thingies. Those are double great! Great story and such a beautiful cabinet!